Take a real and very wild, wild boar with impressive tusks at WildBoar Reserve. Harvesting a true trophy wild boar provides the challenge, excitement and tension not found anywhere. Specials available for groups of eight or more wild boar. Come and stock your freezer with delicious, healthy, chemical free meat ready for a dinner to remember. Fantastic on the barbeque! Harvest your own uniquely challenging wild boar. Prices are per wild boar for groups of two or more wild boar. 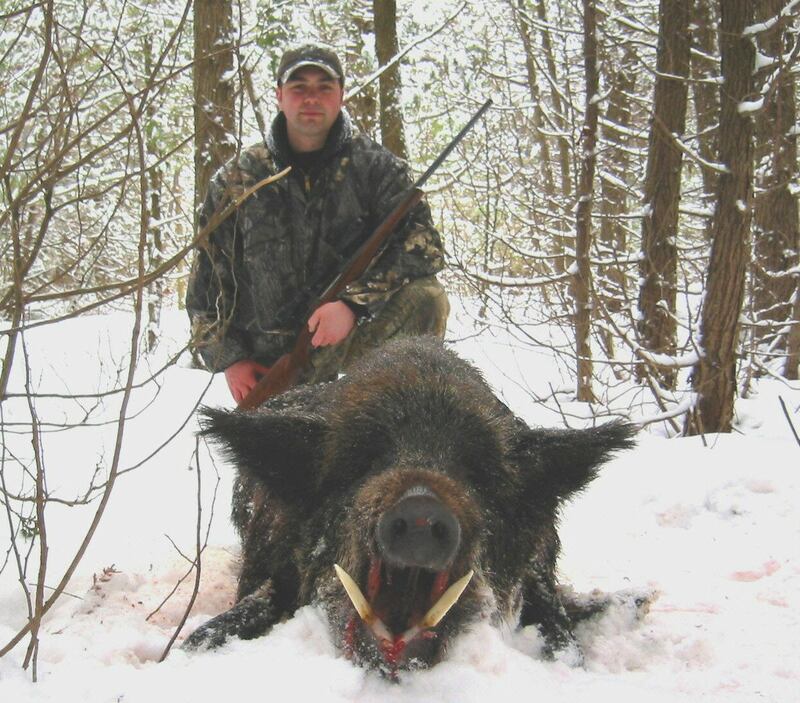 Field dressing, skinning & caping of your wild boar is provided by our professional staff for a small fee. Guide: Guiding is available for those who would like to be accompanied by experience and skill in stalking these cunning beasts. Our guide, familiar with the behaviour of the wild boar, knows how these smart animals play out their strategies and can lay out a plan for you on how to cut your tracking time down. 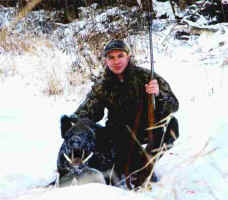 For lone or new hunters a guide makes a great backup partner in your harvest of the wild boar. Physically challenged hunters may also enjoy the excitement of harvesting their own wild boar. Transportation to the bush may be arranged as well as ground stand shooting for those who prefer not to stalk. Our experienced guide, as a backup partner, can teach the tricks to professionally harvesting a wild boar. Video: If ordered in advance, your harvest can be digitally captured on film by our experienced videographer. Titles, etc. as well as fantastic wild boar footage and your stalk complete to the kill and the congrats afterwards will be dramatically edited on computer and transferred to a DVD for your convenience. The final product is then professionally packaged and mailed out to you. Invite your friends over and re-live the experience in the comfort of your own home. Place your order in advance. Lunch: If you can be distracted from the excitement of the harvest, snacks or a full meal can be arranged if ordered in advance. Or bring your own and picnic in the cabin or right in the bush by the river's edge. Nothing beats the excitement of wolfing down a sandwich while grunts are heard in the distance amongst rustling branches (well, except tracking that grunting beast!). Lodging: Relaxing accommodations are available nearby and include a hearty breakfast. There are a few local B&B's we recommend, one as close as Damascus, or private log cabins on a small lake at the Homestead Resort for those long distance travelers who'd like to rest their weary heads. The Resort offers a special dinner package too to our customers. Motels are also nearby. BeastsDen fancy log cabin is also available right at the site with rustic but clean quiet and cosy setting for up to 8 people with breakfast etc available at the ranch house. Butchering: Cutting and wrapping by a professional local processor is available - experienced in the finest cuts and customized to your instructions. He will make mouth-watering sausages or pepperoni, boneless roasts, steaks, etc. or tantalize your taste buds with smoked wild boar meat if time permits. Your meat will be cut, packaged and even vacuum packed, if requested, ready for pickup the day after the harvest. Call for details. Taxidermy: Professional taxidermy work for any of your special requests will be prepared by our local wildlife artist, very experienced in wild boar trophies. He does head mounts, skull mounts, rugs and even leather. We will make all necessary arrangements and when the finished product is ready you're welcome to pick it up or we will ship it out to you. Safety comes first at WildBoar Reserve and we will continue to do our very best to ensure a safe harvest and a good time. We provide our customers a fantastic opportunity to enjoy the great outdoors in lush bush and an exciting harvest on a true wild boar. We welcome you as friends. We are very happy to do our best to guarantee a successful and memorable experience for you.